Where to begin? Much like Sicily itself, where hard decisions have to be made about where to go, the choice of hotels in Sicily is immense, but we’ve tried to make the task a little easier by picking our favourite destinations and accommodation within them. 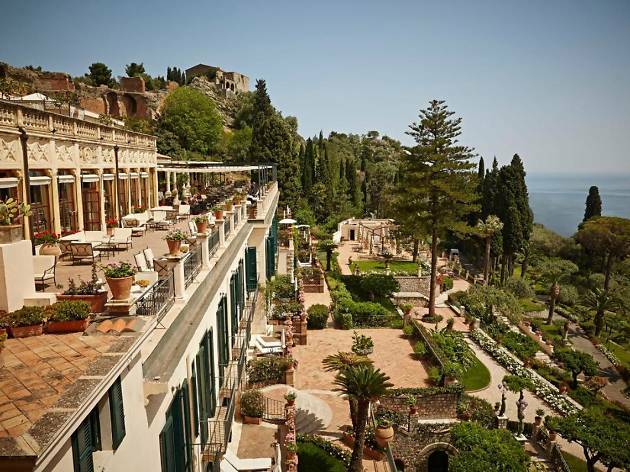 There are city gems like the Alma in Palermo, or grand hotels, such as Taormina’s 19th-century hilltop Timeo, with its stunning views, or the Sant’Andrea with its own stretch of beach. For boutique hotels, there’s the Gutkowski in Syracuse, set within two restored fishermen’s cottages, and the architect-designed Casa Talia, or there’s the Manaci delle Terre Nere, in a restored old winery. 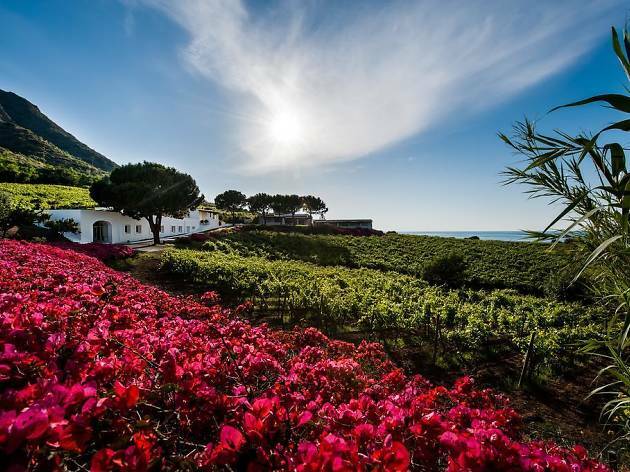 Nature-lovers will appreciate the Minareto resort, set on the edge of a nature reserve, or the lovely Capofaro set on a promontory among the Tasca d’Almerita vineyards. Sound enticing? 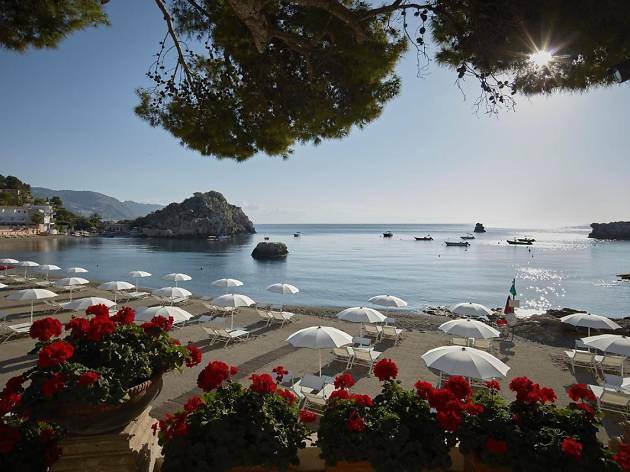 It really is a tricky choice, but hopefully our pick of the best hotels in Sicily will help. 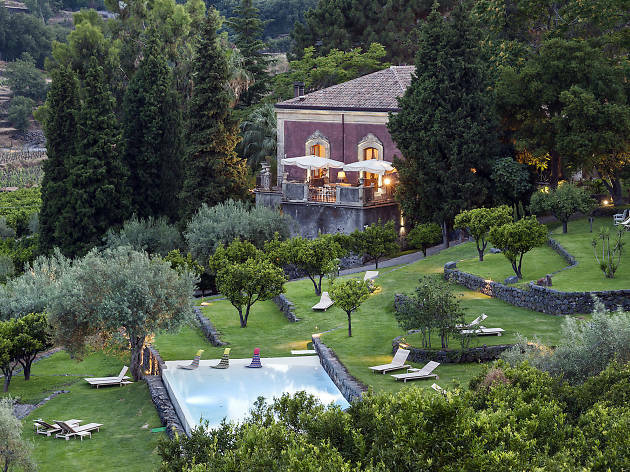 Luxurious 19th-century Grand Hotel Timeo, with its hilltop location, offers exquisite views of Mount Etna and the sea, and the hotel is right beside the remains of a Greek amphitheatre. It’s a Belmond, so expect elegant well-equipped rooms with marble bathrooms; an upgrade might include a terrace, or an outside jacuzzi. A heated rooftop pool is surrounded by gardens, and food and drink is exceptional: bountiful breakfasts, aperitifs in the glamorous bar or on the terrace, then fine dining on Sicilian specialities. Sublime. 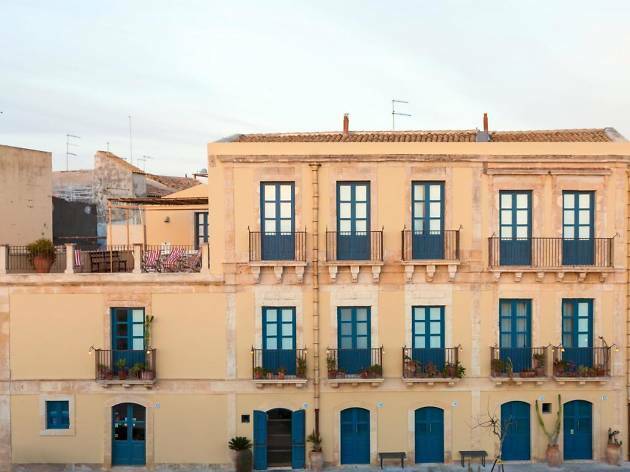 This pastel-blue 3-star boutique hotel lies on the Lungomare Levante, a waterfront promenade on the island of Ortigia, the historical heart of Syracuse. Two old fishermen’s cottages have been beautifully restored to offer 26 individual rooms designed with a pared-back seaside aesthetic and choice pieces of designer furniture. 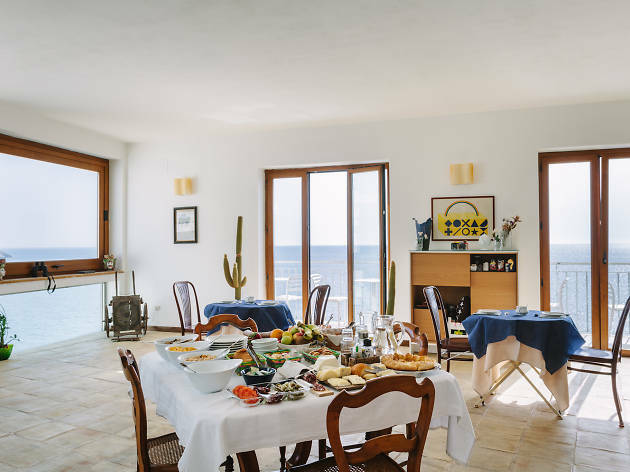 There are two sea-view terraces, one where a delicious buffet breakfast (including freshly squeezed juice and homemade pastries) is served, and a small ground-floor restaurant that serves modern Sicilian-based cuisine until late. Services include free bike hire. 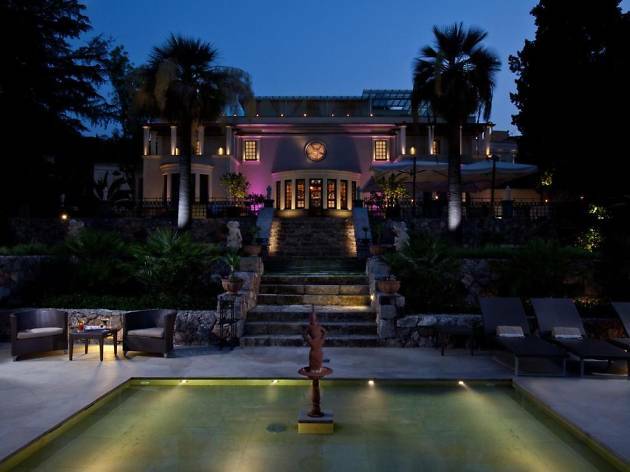 This once privately owned villa maintains its stately elegance. With its own stretch of beach and sub-tropical gardens, the hotel’s enormous floor-to-ceilings windows maximise the views, while contemporary artworks give classically decorated rooms an updated feel. There’s a heated infinity pool, wellness centre with open-air gazebo for massages, and guests can take advantage of facilities at sister-hotel Timeo. The Oliviero terrace restaurant specialises in local cuisine, particularly seafood, and the casual beach bar serves drinks and light meals all day, with music in the evening. 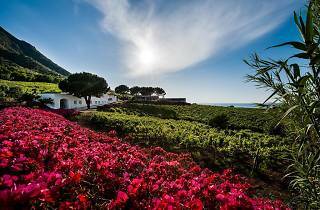 On the greenest of the Aeolian Islands, within the Tasca d’Almerita vineyards at the foot of two extinct volcanoes, a few whitewashed Aeolian houses have been converted into a refined yet minimalist haven. 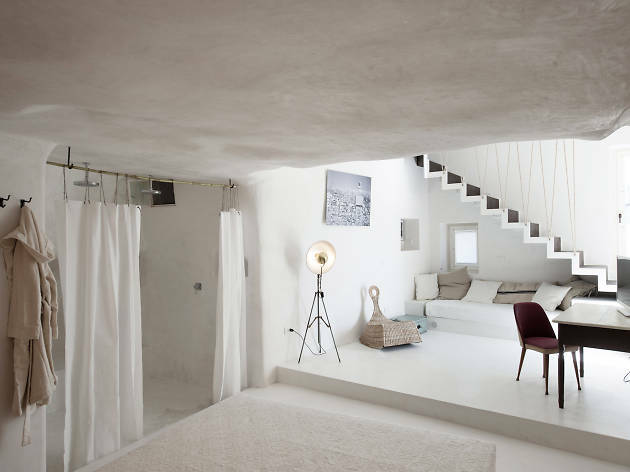 Each of the 21 sea-facing rooms has its own terrace, whitewashed walls and simple decor. A few more rooms are being added within a lighthouse. An infinity pool, tennis courts and gastronomic-level dining complete the picture, along with a chance to taste the Malvasia wine. Regular yoga, pilates and cookery courses are arranged throughout the year. Traditional tiles, local stone and eclectic furniture have been used by architects Marco Guinto and his wife Viviana Haddad to create a hipster hideaway in a pretty Baroque town, an hour from Syracuse. The converted fishermen’s cottages house ten individually designed rooms, all with balconies or terraces. 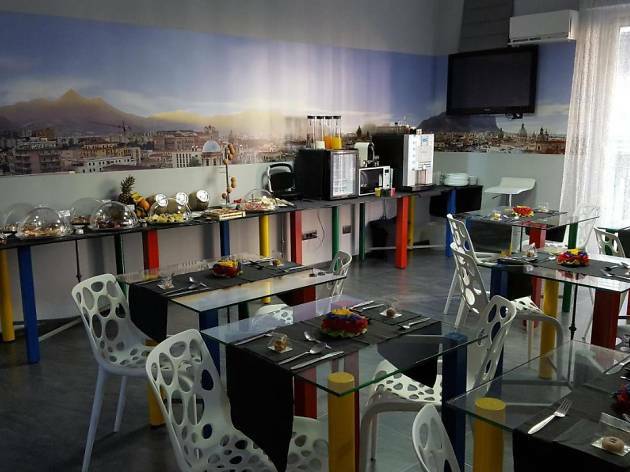 Delicious breakfasts, including Sicilian pastries, are served in a dining area hewn out of a rock, and services include the provision of picnic hampers and tours to local hotspots where you can enjoy them. 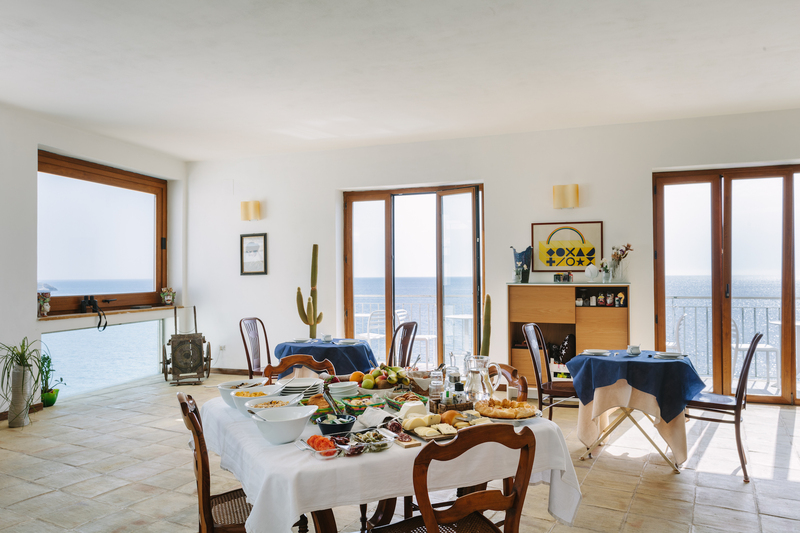 This stylish eco hideaway, 20 miles from Catania, is perfect for those looking to lounge by the pool or sea, have a massage, or go trekking on the slopes of Etna. The restored ‘palmento’ – an old winery featuring many traditional Sicilian materials – is made contemporary with art and designer furnishings. Stylish rooms, many with original weathered beams and lava stone walls, have wood-burning stoves (the hotel is open all year). The restaurant menu is seasonal and mostly local, much coming from the hotel’s organic farm. 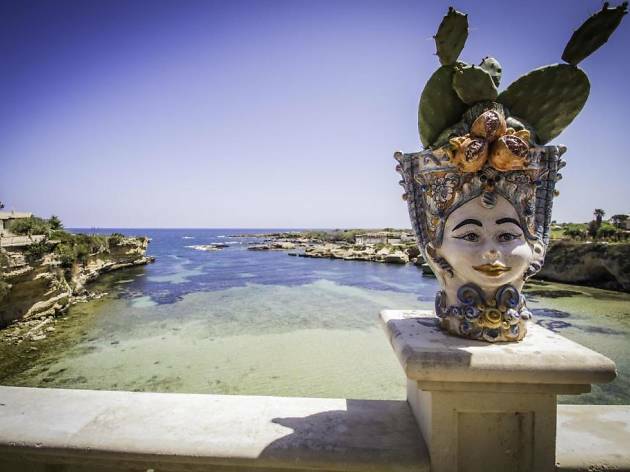 A little out of town on the edge of the Plemmirio Nature Reserve, the Minareto is an enormous complex of rooms, suites and villas surrounded by nature and with stunning views of Ortigia (seven miles away). Rooms are well-equipped, and all have terraces, with larger suites offering private access to a sandy beach. As well as a pool, there’s a Jacuzzi terrace, sports and spa facilities. The Nesos Restaurant and La Terrazza Latomie offer a sophisticated à la carte menu based on traditional dishes and local produce. 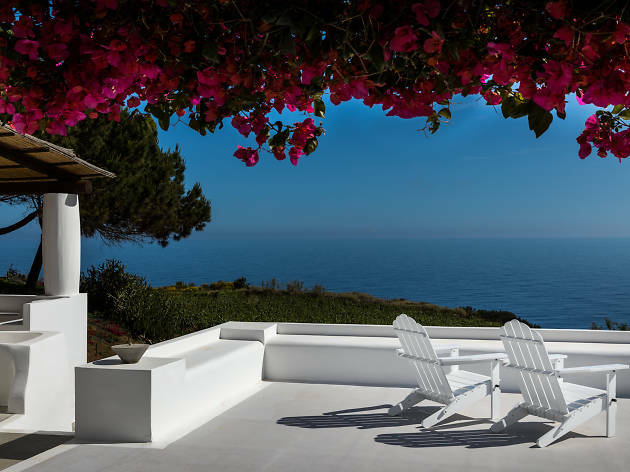 This clifftop B&B overlooking the sea offers seven rooms that are light and bright, with traditional tiles and antique furniture contrasting well with bright contemporary touches. The terrace is the perfect place to take in the spectacular views, especially with an apero in hand. The buffet breakfast is substantial, and services include free bike hire, or it’s a short walk to Solarium Zen, where you can lounge on a sunbed terrace before hitting the Jonico restaurant for everything from pizza to traditional dishes. Set in fine gardens, the Ashbee is a sensitive conversion of a grand villa, with marble and atmosphere aplenty. Light spacious rooms – 25 of them – are understated but feature elegant antique furniture, and some have patios or a terrace overlooking the sea. The panoramic rooftop Terrace Bar serves an excellent buffet breakfast, and pre-prandial cocktails, and, in between, if you can drag yourself out the infinity pool, more food and drink is available at a garden bar. A more formal restaurant serves classic Italian dishes for dinner. Set in the centre of Palermo’s historic centre, the family-run Alma is a tiny gem where the service is noteworthy; owners Paolo and Antonella and their staff go out of their way to make you welcome, with recommendations, directions and information. Though located in an anonymous block, the hotel is bright and contemporary. There are only seven rooms, each with a wall-sized image of the historic city. Guests breakfast on homemade cannoli or cassata and, while there’s no restaurant or bar, there are plenty beyond the hotel entrance.